Well, hello again, everyone! Sorry…I know I’ve been quite AWOL on my blog lately. I may touch on that in a future post, but for now, let’s just celebrate my return and enjoy some good, old-fashioned shopping guides! I can’t believe the holiday season is upon us once again. I feel like I was just writing blog posts for Christmas last year and now, here we are again. I’m not complaining, though – this is easily my favorite time of year. Right now, we’re at that sweet spot where the crowds aren’t too insane (ok, maybe today they are since it’s Black Friday and all) and the Christmas music hasn’t gotten to the point of being annoying just yet. Give it another week or two and I’m sure that’ll all change, but for now, let’s enjoy this magical time of year, shall we? This year, I’ve been seriously crushing on anything sparkly and shiny. The wonderful thing about anything that glitters is that it’ll instantly give your space a festive feel, but it’s not so exclusive to the holidays that you’ll have to tear it all down once the new year hits. You can totally keep this stuff in your house all throughout the winter season and it’ll look appropriate and fun without screaming C H R I S T M A S. The best part of all is that all the items on this list are well under $100 and they’re incredibly easy to incorporate into your home without any fuss. I found the majority of these items at H+M (online only) and I have to say, this is easily becoming one of my favorite places to shop for home decor. They have incredibly cute items at affordable prices – what’s not to love? Anyway, let’s get to this list, shall we? Glittery Throw: This is more of a subtle way to add sparkle, but it’s so, so pretty. Combine a warm, cozy throw with just a little bit of sequin detail and shiny threads and you’ve got yourself a blanket you might just want to use all year round! Edison Bulb Fairie Lights: These lights are so much fun! Each bulb actually has a strand of little string lights inside, so they all have a unique look. It’s a take on a traditional string of mini lights, so you could put these up on your fireplace mantle, above your bed or really anywhere your imagination allows. Oh, did I mention that the lights also change color?? Candle Holders: This is one of the easiest items to incorporate into your decor without spending much at all. As I mentioned above with the table lamp, sparkle + light = major magical vibes. Honestly, you can even get some glittery tealight holders at the dollar store and just toss them strategically around your house. I promise you won’t even spend $50 this way (if you do, your friends and family might stage an intervention). Napkin Rings: As with the candle holders, napkin rings are an easy, affordable way to add some bling. You could even get crafty and get some plain napkin rings, use some spray adhesive, and cover them with any color of glitter you want. Or you could spray paint them a metallic color. Either way, let your imagination run wild and you can create some unique, festive napkin rings that’ll match your decor. Just don’t let your cats get ahold of them. Shiny Serving Dish: I know, I know – I have a major pineapple addiction. You don’t have to get a pineapple-shaped dish if you don’t want to. However, this one’s adorable. Plus, it’s only $5.99 at H+M, so GO WILD. Sequined Table Runner: This is actually what inspired this blog post. When I saw it, I was like, NEED. THIS. NOW. Buuuuut….they don’t ship this item to Canada, so that’s kind of rude. For all my lucky American friends, I would recommend buying it TODAY because it’s on sale for $9.99. I, however, will have to go find another option. Hmmmph. Bow Pillow: OK, when I saw this, I couldn’t even contain my excitement. Throw pillows are, admittedly, one of my biggest obsessions. Throw (<– see what I did there?!) a pillow my way that’s shaped as anything but a square or rectangle and I just get that much more excited. That’s why this glittery piece of perfection got its own spot on this list. It’s extraordinary. Plus, it reminds me of something Kate Spade might design, but at a fraction of the cost. Yes, please. Sequined Slippers: Yes, I realize this isn’t technically a home decor item. But let me ask you: where do you wear slippers? At home. So that’s my justification. If you have these slippers, you can totally wear them while entertaining guests and I don’t think they’d even care. Your feet can be toasty, you can be comfy and everybody wins. Throw Pillows: As I mentioned above, I LOVE throw pillows. They can change the vibe of your space so easily and there are so many options out there. If you want to incorporate the sparkle + shine look, you can go with sequined or metallic ones (or a combo of both) to create your own unique look. Don’t be afraid to mix your metallics, either. Gold, silver, rose gold or any color, really, tend to look fabulous together. Just go with whatever colors you’re drawn to and work with whatever color scheme you already have going on. Oh and here’s the link for the other pillow pictured. BONUS: Glittery Rug: It wasn’t until I finished writing this post that I realized that I was all silly and forgot to add this adorable rug to my collage! This is another H+M find and it’s only $19.99 right now. It’s fairly subtle and can probably work with most color schemes. This is another way to add a cozy and sparkly element to your space. 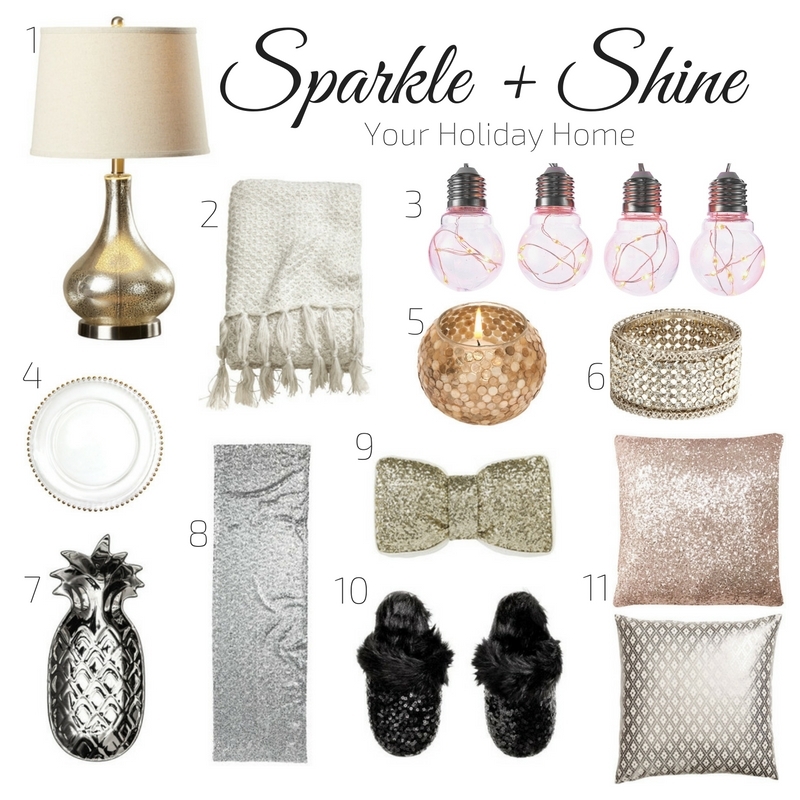 It’s so easy to incorporate sparkly elements to your home. Just let your imagination run wild and you can make your space feel festive and glittery without breaking the bank or putting too much work into it. Stay tuned for more fun shopping guides coming your way soon!